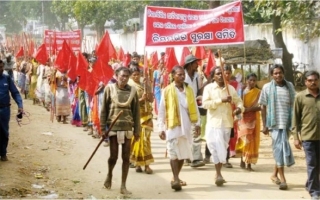 On Thursday 6th December tribals and farmers of the grassroots organisations Niyamgiri Surakhya Samiti, Loka Sangram Mancha, Samajwadi Jan Parishad, and Sachetana Nagarika Mancha will hold one of the largest demonstrations ever on the threatened Niyamgiri mountain since the movement began. In anticipation of the final Supreme Court decision on the planned mega-mine ten thousand people are expected to rally on the mountain in a show of defiance. They will call for closure of the sinking Lanjigarh refinery and an absolute ban on the so-far-unsuccessful attempt to mine bauxite on their sacred hills. Here in London we will be holding a noise demonstration outside the India High Commission in Aldwych calling for the Indian Government to put a final stop to this contested project, and for the state owned Orissa Mining Corporation to be pulled out of dodgy deals it has made with Vedanta in an attempt to force the mine through the courts on Vedanta’s behalf. Please join us and bring drums, pots and pans and anything that makes noise! The movements in Orissa will feel your solidarity! “A noisy group of protesters armed with horns, megaphones and pots and pans crowded the entrance to the India High Commission today demanding that the Indian Government stop the controversial Niyamgiri mine in Odisha, India. Meanwhile five thousand tribals and farmers living around the Niyamgiri hills held one of largest demonstrations on the mountain since the movement began. Outside the Indian High Commission protesters from Foil Vedanta shouted slogans calling for the Indian Government to put a final stop to Vedanta’s long contested bauxite project in the unique tribal region of Niyamgiri. They demanded that the state owned Orissa Mining Corporation is pulled out of dodgy deals it has made with Vedanta in an attempt to force the mine through the courts on Vedanta’s behalf. They called for London to withdraw support for the UK registered company accused by CBI’s former director Richard Lambert and the British parliament for giving the FTSE 100 a bad name.